Delegate: Mr. Frederik Stockholm Madsen , Energistyrelsen, EUDP. Wave energy activities in Denmark continue to be driven by the Strategy for Wave Power published 6 years ago and by the Danish Wave Power Roadmap from 2015. Wave energy in Denmark is funded mainly through the EUDP. There are 10 active Danish wave energy developers: Exowave, Weptos, Resen, WavePiston, Waveplane, Floating Power Plant, Leancon, Crestwing, KN Swing and Wave Dragon. 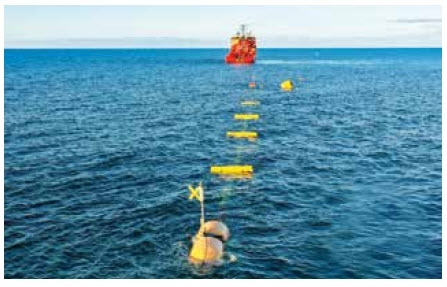 The most relevant wave energy activities recently undertaken include: The collaboration of Floating Power Plant, a hybrid wind and wave technology, with DP Energy for the development of projects in Scotland and Wales; the installation and testing of Crestwing prototype with data to be analysed by NIRAS in co-operation with DHI; and the testing at of the WavePiston at the DanWEC test site and the completion of the WEPTOS testing in sheltered water. Wave energy activities in Denmark continue to be driven by the Strategy for Wave Power published in 2012 and by the Danish Wave Power Roadmap from 2015. Denmark has created a plan for the use of the sea; the partnership for Wave Energy has participated in the planning meetings – along with aquaculture, wind-power to discuss synergies that could be a result of shared use of sea space. Denmark has established the test site DanWEC. The Energy Agency is dealing with matters concerning permits of installation wave energy test units at sea. Wave energy in Denmark is funded through the EUDP along with other renewables. Innovationsfonden has since 2010 supported innovation in relation to activities related to waves and floating structures. The figure below shows the distribution between different technologies1. The Danish Funding Agency EUDP has funded the proposal submitted by Ramboll in 2017 in collaboration with Aalborg University, DTU and Floating Power Plant to work and help co-ordinate the international collaboration on OES Task 10 with focus on Modelling, Verification and Validation of Wave Energy Converters (WECs). OES Task 10, which involves experts from 13 countries, was agreed to during the 31st EXCO in 2016 with the objective to improve the confidence in the numerical tools used in design and prediction of power production from Wave Energy Converters. Mooring Solutions for Large Wave Energy Converters (MSLWEC) 2016 – 2018 has been co-ordinated by Aalborg University, investigating different mooring solutions suited for large WECs being investigated in Denmark, such as Floating Power Plant, WaveDragon, Leancon and KNSwing. The use of synthetic mooring lines showed to be more cost effective compared to conventional catenary mooring lines. The project has resulted in several publications, such as “Cost Optimization of Mooring Solutions for Large Floating Wave Energy Converters” Energies 2018, 11. Floating Power Plant was tested in model scale as part of the project. The new test facility at Aalborg University is part of the Marinet 2 infrastructures, and some Danish developers have received funding from the programme to carry out model tests. The objective of MARINERG-i is to become the leading internationally distributed infrastructure in the Marine Renewable Energy (MRE) sector. Its integrated nature and co-ordinated approach will accelerate the research development and deployment of offshore wind, wave, tidal and combined energy technologies and help maintain Europe as a global leader in this industry. In addition, MARINERG-i will strengthen European, scientific and engineering excellence and expertise as its’ combined facilities represent an indispensable tool to foster innovation across a large variety of MRE technologies and systems and through all key stages of technology development (TRLs 1-9). Denmark is represented in the European project WECANet (www.wecanet.eu), a pan-European network with an interdisciplinary marine wave energy approach aiming to provide a strong networking platform for all stakeholders in wave energy. This project is funded by the European Cooperation in Science and Technology action (known as ‘COST’ action). ICONN is a unique European Industrial Doctorate initiative to meet the current and future demand for highly skilled offshore wind and wave energy engineers by developing and advancing European capacity in the design, development and performance optimisation for Offshore Wind and Wave Energy installations. The initiative is strongly shaped by active participation from industries and will develop and enhance European capacity in the offshore renewable energy area at a critical juncture in time when Europe strives to occupy a lead market position globally in this sector. Project partners are Aalborg University, Trinity College and Floating Power Plant. Offshoreenergy.dk (now called Energy Innovation Cluster) is partner in the ELBE (Europe Leading Blue Energy) project co-ordinated by the Basque Energy Cluster, including Aberdeen Renewable Energy Group, Flanders’ Maritime Cluster, Offshoreväst (Sweden), acknowledging the importance of marine energy technological development and wave, tidal and floating wind power represented by these European clusters. This project is part of the European Union DG GROWTH "Cluster Go International" programme. The purpose of ELBE is to forge a formal alliance between participating bodies and define a joint internationalisation strategy for SMEs to be launched in the second phase and the organisation of several networking events among the companies of the different regions at the end of 2018 and the start of 2019. The project is supported by EUDP from 2016 to 2019 and lead by Aalborg University. During its execution, the project will determine whether it is possible to use the material resulting from sea water electrolysis for step-change improvements to the state of the art of available materials and construction practices in the wave energy and offshore sector. A first test of the new concept was carried out at DanWEC in Hanstholm and a second test started in Nissum in November 2018. The test site facility DanWEC is located with an offshore test site facing the North Sea (Hanstholm) where several Danish concepts have been tested and a more sheltered site in Nissum Bredning is also part of the DanWEC portfolio offered to testing in smaller scale. The testing of the Wavepiston prototype started in 2015 at the DanWEC test site with several development iterations increasing the energy production and durability in each iteration. The first prototype tested was a 150-m string, which in the first iteration was equipped with 2 energy collectors, each fitted with a 4 m2 plate. In the second and third iteration another 4 energy collectors were fitted with a 7 m2 plate each. In the current 2018 iteration the string is 100 m. Four energy collectors have been tested each with an 8.5 m2 plate and there is the possibility to test up to 6 energy collectors. Different storm protection systems are tested on the energy collectors. The storm protection system reduces the plate area when forces get too big. Data from the loads and the energy production is collected on a computer on the inner buoy and uploaded to a server every 6 hours. The data on the collected energy is analysed and compared to the predictions from the Wavepiston Energy Tool developed in collaboration with the Technical University of Denmark. Peak wave periods TP: 3 – 7.5 s.
Crestwings prototype Tordenskiold was launched in Kattegat in autumn 2018, northeast of the islands of Hirsholmene, in Frederikshavn Municipality. 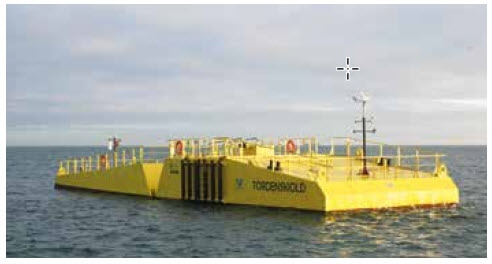 Tordenskjold will be tested in Kattegat as a suitable scaled ocean to confirm the reliability of the mooring at sea and confirm the expected production of energy. The plant will be tested in this position through the year 2020. It has taken Crestwing 14 years and about 30 million DKK to get to the point of a prototype that can easily be scaled up and produced. Crestwing expect to produce energy at a kWh price, which corresponds to the production of other renewable energy types. The data from the testing of Crestwing prototype will be analysed by NIRAS in co-operation with DHI. Peak wave periods TP: 3 – 5.5 s.
The scale testing of WEPTOS in co-operation with AAU was deployed in July 2017and completed in October 2018. The deployment location was in Lillebælt between Jutland and Fyn in Denmark, north of the small island Brandsø. The test results are presented in Proceedings of OMAE2018 conference 17-22 June 2018, Madrid, Spain. In wave conditions with Hm0 = 0.27 m and Te = 2.11 s, and the maximum and mean power within the 15 min measurement period was 1805 W and 335 W measured on one “leg”. The project had financial supported from the R&D programme ForskEL. Water depth of 10 m.
Peak wave periods TP: 2.0 – 3.5 s.
Nemos plan for tests at DanWEC Hanstholm 2019. WavePiston plans to continue testing at DanWEC Hanstholm 2019. ResenWaves expects tests in 2019 in Nissum Bredning. The Danish Wave Energy Partnership meetings in 2018 are relevant for the development of the sector. The meetings typically focus on the dissemination of results among the partners and as an occasion to initiate new common development activities. These have been held twice in 2018, at 15 March before the launch of Crestwing and at 11 September 2018 at Aalborg University. The partnership involves the 10 active Danish wave energy developers: Exowave, WavePiston, Waveplane, Weptos, Floating Power Plant, Leancon, Crestwing, KN Swing, Wave Dragon and Resen. The partnership has its secretariat at Energy Innovation Cluster (http://www.eicluster.dk/) providing links and networks opportunities to develop innovative solutions and synergies with other maritime industry. Marine Spatial Planning (MSP) is used as a decision tool for offshore wind. Specific ocean energy space is not reserved. The Danish Parliament and the various Governments of Denmark have in their Energy Agreements focus on offshore and nearshore spatial planning in the long-term goal for Danish energy policy. The latest Energy Agreement (Energy Bill) for the period 2012-2020 has specific focus on offshore wind turbine sea-spaces (Kriegers Fak and Horns Rev) as well as 6 dedicated offshore coastal areas. Pre-selected areas for ocean energy have not been defined. However, historic test sites are recognized as potential areas by authorities. • The Ministry of Defense – responsible for the monitoring of maritime traffic and marine environment, rescue services and handling of pollution at sea. • License to exploit ocean power for a given number of years and an approval for electricity production (given if conditions in license to establish the project are kept). The consenting process last from few months for a single device at unproblematic sites to several years. The Danish Energy Agency is the “one stop shop” facility for the ocean energy consenting process. The assessment is based on an analysis on the following topics: technical solutions, maritime and environmental safety precautions, organizations planning process and consent to environmental risks, and involvement of and consent by relevant other interests at sea. The Danish Energy Agency and the Danish Environmental Agency are both the entities responsible for the decision on whether an EIA is required. Monitoring of e.g. offshore wind turbine parks are made by the owners. Decommissioning plans must be presented at application and performed at the end of e.g. periodic ocean technologies test programs. Consultation is done at the stage of the preliminary investigations. Local Municipality has to be consulted and public hearing meeting published and held. For the less visible ocean technologies and sites outside the public reach (surfing, diving, bathing, leisure sailing, landscape and seascapes values) the process can be simple and short. For visible technologies the process can take longer. Informal consultation activities can be implemented during the licensing process by direct contact with the authorities. There is guidance available to help developers during the process through the energy authority and e.g. DanWEC. Wave energy converters to be tested at DanWEC or at other locations in Danish waters will typically receive a temporary permit for deployment over the testing period - one or two years. Such permit can be obtained by filling an application to the Danish Energy Agency that will process the application.